Republicans likely could hardly believe their luck when they heard that the Leader of the Nanny State, Michael Bloomberg, was considering an independent presidential run. For those of you new to PeakNation™, Bloomberg has a storied history in Colorful Colorado. Below are the ten issues that Bloomberg should run on if he decides to enter the race. Mike, don’t say we never did anything for you. 10. Soda bans – This one was just too easy. As Mayor of New York City, Michael Bloomberg tried to ban large soda sizes. New York State’s Court of Appeals eventually overturned the oversized ban, but this was just a harbinger of meddling in personal decisions to come. 9. Infant formula bans – On the heels of his soda ban, Bloomberg thought he knew breast, er best, by trying to ban formula in hospitals for infants, essentially forcing mothers to breastfeed. Anyone who has been on Facebook knows that this debate is…sticky. We hope he jumps right in the middle of this sucky debate as a presidential candidate. 8. Young minority male gun ban – You guys, when Bloomberg suggested that young, minority males be banned from having guns, he wasn’t racist like it totally sounds. He’s just misunderstood? We kid. That sounded super racist, not to mention unconstitutional. Please run on this. 7. Udall to lead the EPA – Colorado may not have loved former Sen. Udall, but Bloomberg sure did. He showed his love in at least $2.5 million ways by donating to a Super PAC meant to save the uber-enviro. Udall’s talent and love of all things environmental need not go to waste. We hear the EPA might have a leadership issue. 6. Government-sponsored college scholarships for you, and you, and you – Some consultants in need of a bottom-line boost came up with the uneducated idea to dole out Denver city-sponsored college scholarships. This is not a legitimate function of government. You know who hated this idea? The Denver Democrats’ central committee. (Yes, it was that bad.) You know who loved this idea? Michael Bloomberg. He gave $150,000 to the beleaguered effort, which failed anyway. 5. Alienating suburban and rural populations – When Bloomberg was trying to wave off the fact that his gun control legislation resulted in the recall of two Democratic state Senators, he proclaimed that Colorado Springs and Pueblo have no roads. That is to say that these two towns are so a$$backwards that they barely have running water. Except that Colorado Springs and Pueblo do have roads and are among the largest towns in Colorado. But, facts, facts, who needs facts? 4. Hick for VP – For the love of God, will someone please find this guy a presidential candidate who will adopt him as a VP candidate? Please? The groveling around every candidate that comes to town is just too much. Plus, Bloomberg already loves this guy, just put a ring on it. 3. Billion dollar tax increases – Bloomberg loved him some Amendment 66, which was a scheme to insert another billion dollars into the system through a ridiculously huge tax increase. Colorado, and we suspect the rest of the country, hates tax increases because everyone knows that the government will waste the money on dumb stuff. If a billion dollars was the Colorado level that Bloomberg embraced, what is the federal equivalent? Trillion dollar tax increase? What comes after trillion, again? 2. Terrorists are victims, too – Bloomberg’s Mayors Against Illegal Guns read names of gun violence victims at a rally. Guess who was named? The Boston Bomber, Tamerlan Tsarnaev, who was killed in a gun fight with police when he tried to escape. Guess who else? A bunch of suspected murderers and criminals who tried to kill police officers, and more. Everyone loves a criminal…or something. Right? 1. 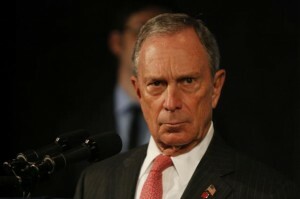 Gun control – Obviously, we think the number one issue that Bloomberg should run on is gun control. While this has been his legacy, it’s also his Achilles’ heel. People just don’t like his gun grabs. Period. So, definitely run on that. While we support Bloomberg’s adoption of any and all of these issues as planks of his presidential platform, the real reason we want him to run is because he doesn’t take votes from Republicans. It’s Democrats that he hurts, and we say, have at it, Mike. Michael Bloomberg is a statist who has proven that even trivial personal choices and liberties are subservient to the will of the state.